Today I thought I would share this classic Welsh song “Ti a dy ddoniau” (You and your skills), written by comedian and singer/songwriter/actor Ryan Davies. Ryan formed part of a comedy duo with fellow actor Ronnie Williams. They were popular on Welsh language TV in the 1970s, “Ryan a Ronnie” (Ryan and Ronnie) became so popular that it was transferred to an English language version. I remember watching both Welsh and English versions as a child. Ryan (1937-1977) was born in Glanaman in Carmarthenshire (west Wales), and first performed professionally at the National Eisteddfod in 1966. 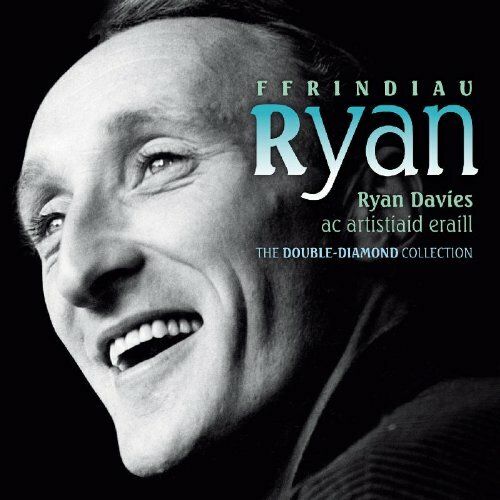 “Ti a dy ddoniau” is my favourite Ryan Davies song, although it is possibly not his most famous. He is considered one of the giants of Welsh language TV entertainment, there is a bust of him in the foyer of the BBC studios in Llandaf (Cardiff) which I have seen many times on my visits there to do astronomy interviews. Ryan Davies (1937-1977) was a Welsh actor, singer, songwriter and comedian. He was born in Glanaman in west Wales. He is best known for his TV comedy series “Ryan a Ronnie” (Ryan and Ronnie). He was also an accomplished singer and songwriter. This is the cover of one of his CDs. “Ti a dy ddoniau” is clearly written by a man who is very bitter. Lied to, made a fool of and hurt, the man is lashing back. Ryan himself married his childhood sweetheart and they remained married throughout his life; so I can only assume that he did not write these wonderful lyrics from personal experience. Here are the lyrics of “Ti a dy ddoniau”. O ble gest ti’r ddawn o dorri calonne? O ble gest ti’r ddawn o ddweud y celwyddau? Ac o ble gest ti’r wên a’r ddau lygad bach tyner? Ac o ble gest ti’r tinc yn dy lais? Wel do, mi lwyddaist, mi lwyddaist yn llawn. A minnau yn ateb fel hyn, “Caraf di nawr”. Ac o ble, ac o ble, ble rwyt ti? Here is my attempt at a translation. As usual, I have gone for a literal translation, with no attempt to retain any rhythm or rhyme. From where did you get the skill to break hearts? From where did you get the skill to tell your lies? And from where did you get that smile and those two sweet tender eyes? And from where did you get the lilt in your voice? Well yes, you succeeded, you succeeded completely. From where did you get the skill? And my answering like this, “I will love you now”. Oh from where, oh from where did you get the skill? I could not find a video on YouTube of Ryan performing this song, although there are versions sung by other artists. So, I have created this video, which is the definitive version; Ryan singing it with his longtime comedy and entertainment partner Ronnie. Enjoy! Which is your favourite Ryan Davies song? 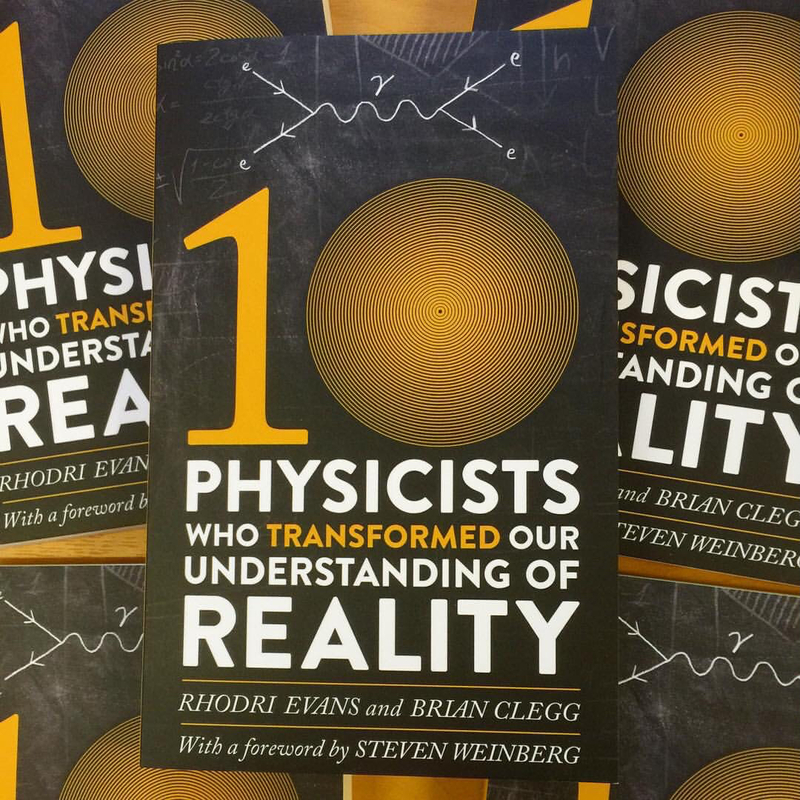 A very clear and timely explanation of one test of Einstein’s general theory of relativity – the search for gravitational waves. Cardiff University has a very active research group in this area. 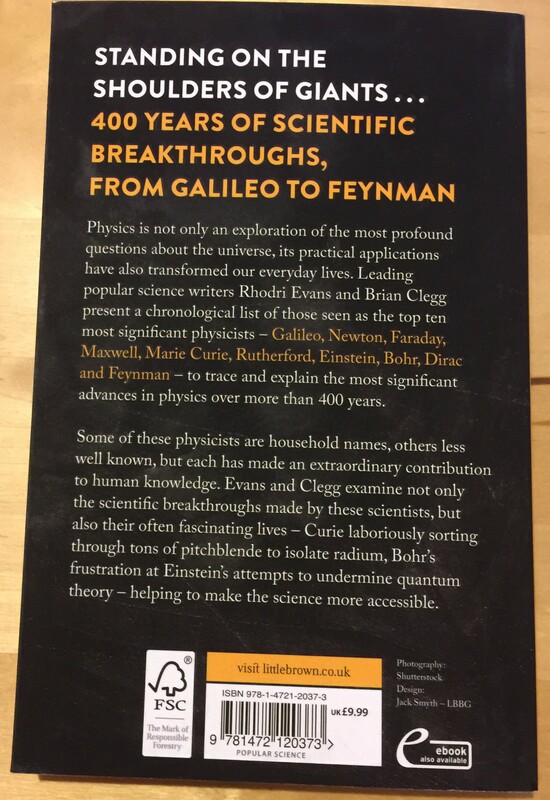 There has recently been a flurry of media stories about experiments searching for gravitational radiation, usually with headlines about “testing Einstein’s theory”. In fact, these experiments are testing our ability to measure gravitational radiation, because there is already compelling proof that this prediction of the general theory of relativity (which is itself exactly 100 years old as I write) is correct. This extract from my book Einstein’s Masterwork (http://www.iconbooks.com/blog/title/einsteins-masterwork/) should make everything clear. But the experiments are still hugely important. If we can detect gravitational radiation directly, we will have a new way to study things like black holes, supernovas — and binary pulsars. Following on from my derivation of the moment of inertia of a disk, in this blog I will derive the moment of inertia of an annulus. By an annulus, I mean a disk which has the inner part missing, as shown below. An annulus is a disk of small thickness with the inner part missing. The annulus goes from some inner radius to an outer radius . The total mass of the annulus can be found by considering the total mass of a disk of radius (which we will call ) and then subtracting the mass of the inner part, a disk of radius (which we will call ). The mass of a disk is just its density multiplied by its area multiplied by its thickness. As we saw in this blog, the moment of inertia of a disk is . It may therefore seem, at first sight, that the moment of inertia of an annulus is more than that of a disk. This would be true if they have the same mass, but if they have the same thickness and density the mass of an annulus will be much less. Let us compare the moment of inertia of a disk and an annulus for the 4 following cases. 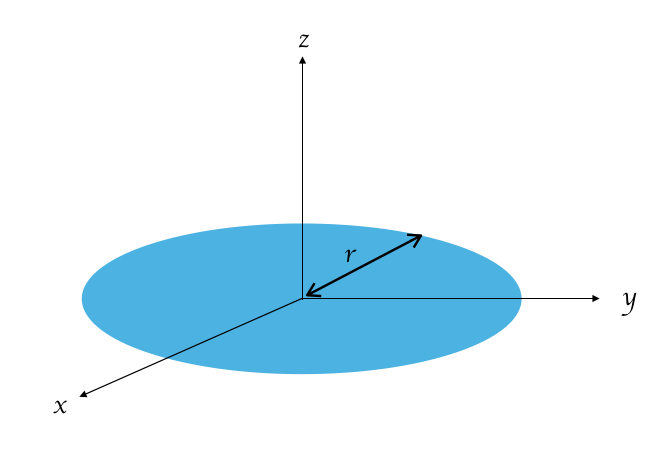 We are first going to compare the moment of inertia of a disk of mass with that of an annulus which goes from half the radius of the disk to the radius of the disk (i.e. . So, for this case, , i.e. slightly less than the disk. which is much less than the moment of inertia of the disk. So, as these calculations show, if keeping the mass of a flywheel down is important, then a larger moment of inertia will be achieved by concentrating most of that mass in the outer parts of the flywheel, as this photograph below shows. In the next blogpost in this series I will calculate the moment of inertia of a solid sphere. At number 38 in Rolling Stone Magazine’s 100 greatest Beatles songs is “Blackbird”. Although credited to Lennon and McCartney, this 1968 song was not only composed solely by McCartney, but also he is the only one performing on the song. It appears on the Beatles’ White Album (officially known as “The Beatles”), an album I blogged about here as it is at number 10 in Rolling Stone’s list of the 500 greatest albums. By the time the White Album was recorded during the summer of 1968, the rifts amongst the members of the Beatles were beginning to appear. Probably most (if not all) of the Lennon and McCartney songs on the album were composed separately, and often they would record their part of the song separately too, with the other members each adding their parts as overdubs. Hardly any of the songs were recorded with all four of them playing at the same time. Abbey Road studios effectively had Lennon, McCartney and Harrison each working in three separate studios. I remembered this whole idea of “you were only waiting for this moment to arise” was about, you know, the black people’s struggle in the southern states, and I was using the symbolism of a blackbird. It’s not really about a blackbird whose wings are broken, you know, it’s a bit more symbolic. 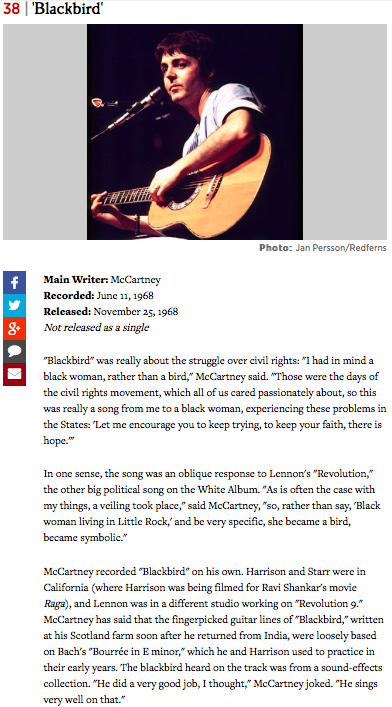 At number 38 in Rolling Stone Magazine’s list of the 100 greatest Beatles songs is “Blackbird”. The melody of the song was inspired by Johann Sebastian Bach’s Bourrée in E minor, a lute piece which McCartney and Harrison used to attempt to play as teenagers to showcase their proficiency on the guitar. The melody of the song is beautiful, and it is my favourite McCartney song on the White Album. Which is your favourite McCartney song on the White Album? At number 22 in Rolling Stone Magazine’s list of the 100 greatest songwriters is Northern Irish singer/songwriter Van Morrison. Van Morrison is one of my favourite songwriters, he has written many memorable songs including “Bright Side of the Road”, “Brown Eyed Girl”, “Gloria”, “Moondance” and “Have I Told You Lately”. At number 22 in Rolling Stone Magazine’s list of the 100 greatest songwriters of all time is Van Morrison. 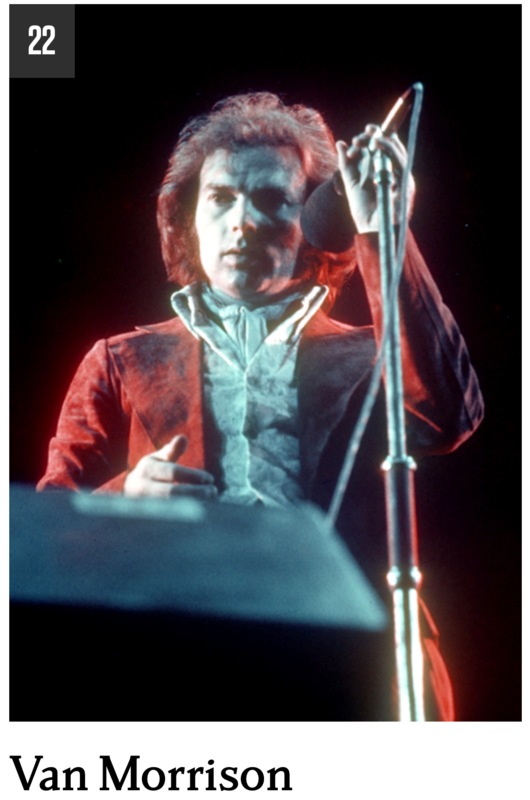 Morrison was born George Ivan Morrison in 1945 in Belfast, Northern Ireland. He first came to prominence as the lead singer of a Rhythm and Blues band Them, who formed in 1964. In 1965 Them had two hit singles in the DUK, “Baby, Please Don’t Go” (which got to number 10) was an old delta blues standard which had been popularised in the 1930s by Big Joe Williams. Them’s second hit single was “Here Comes the Night” (which got to number 2) and was written by American songwriter Bert Berns. “Gloria”, written by Morrison, was the B-side of “Baby, Please Don’t Go”, but has gone on to become a more famous song. In the summer of 1966, towards the end of a tour of the United States, Them split up, and although they would later go on to reform, this was the end of Morrison’s involvement in the band. In 1967 he launched his solo career with the release of the single “Brown Eyed Girl”. This song appears on his first solo album, “Blowin’ Your Mind”, which was released by Bang Records without his knowledge after he had originally recorded eight songs which he thought would be released as four separate singles. Morrison then signed with Warner Brothers and in 1968 he released “Astral Weeks”. This is often considered his greatest album, and featured in my blog here about the 500 greatest albums of all time, as it is in that list at number 19. With so many good songs to choose from, it has been difficult for me to choose just one, but I have decided on his first solo single, “Brown Eyed Girl”. It is beautiful example of Morrison’s wonderful lyrics and ability to write great music, and nicely displays his vocal talents as well. Which is your favourite Van Morrison song? The moment of inertia about the other two cardinal axes are denoted by and , but we can consider the moment of inertia about any convenient axis. In this blog, I will derive the moment of inertia of a disk. In upcoming blogs I will derive other moments of inertia, e.g. for an annulus, a solid sphere, a spherical shell and a hollow sphere with a very thin shell. For our purposes, a disk is a solid circle with a small thickness ( , small in comparison to the radius of the disk). If it has a thickness which is comparable to its radius, it becomes a cylinder, which we will discuss in a future blog. So, our disk looks something like this. 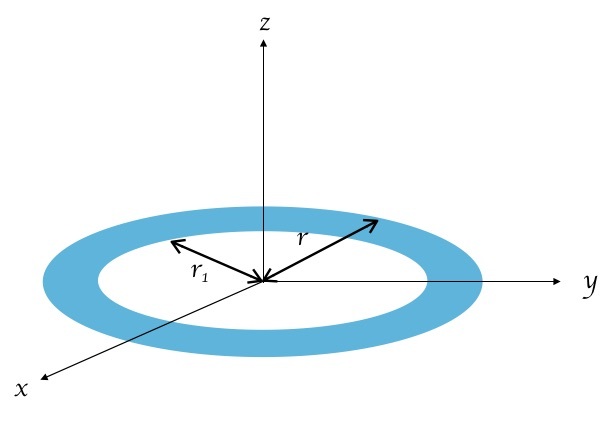 To calculate the moment of inertia of this disk about the z-axis, we sum the moment of inertia of a volume element from the centre (where ) to the outer radius . (where is the density of the volume element). We will assume in this example that the density of the disk is uniform; but in principle if we know its dependence on , this would not be a problem. The volume element can be calculated by considering a ring at a radius with a width and a thickness . The volume of this ring is just this rings circumference multiplied by its width multiplied by its thickness. What are the moments of inertia about the x and y-axes? where and are the two moments of inertia in the plane and perpendicular to each other. 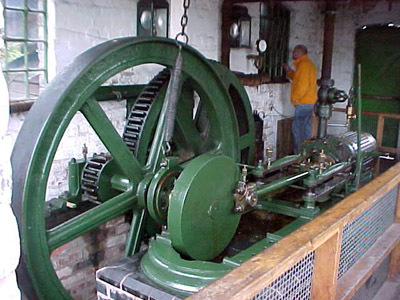 Flywheels are used to store rotational energy. This is useful when the source of energy is not continuous, as they can help provide a continuous source of energy. They are used in many types of motors including modern cars. It is because of an disk’s moment of inertia that it can store rotational energy in this way. Just as with mass in the linear case, it requires a force to change the rotational speed (angular velocity) of an object. The larger the moment of inertia, the larger the force required to change its angular velocity. As we can see above from the equation for the moment of inertia of a disk, for two flywheels of the same mass a thinner larger one will store more energy than a thicker smaller one because its moment of inertia increases as the square of the radius of the disk. Sometimes mass is a critical factor, and next time I will consider the case of an annulus, where the inner part of the disk is removed.